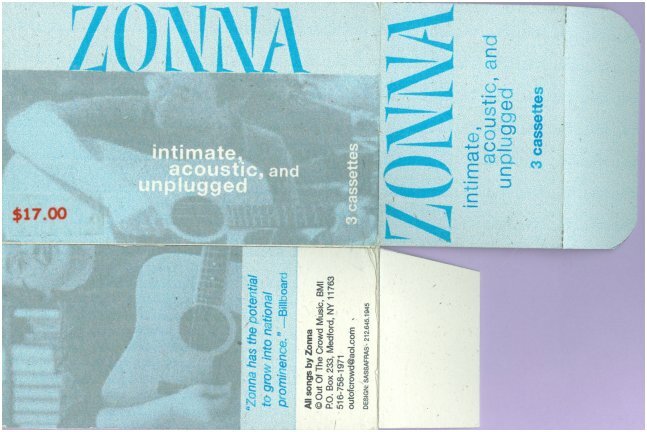 On May 23, 2003, I was honored to be able to hear Zonna in what would be her last performance, a house concert with Corinne Curcio, held by Ed Mannix. I was visiting Ed that weekend and as the out-of-towner, he asked me who I would like to see, and I immediately said Zonna. And he arranged it. I taped the concert with my mini-disc recorder, and while it is of course not more than the most amateur recording, I think it still shines a light on her talent and warmth. So I am allowing the 73-minute show to be downloaded. Click to Download. A generous contributor to the cause of LGBT music and a passionate supporter of numerous out musicians, singer/songwriter Zonna died Monday, December 1, 2003 from heart failure due to complications from diabetes and colon cancer. She was 43. 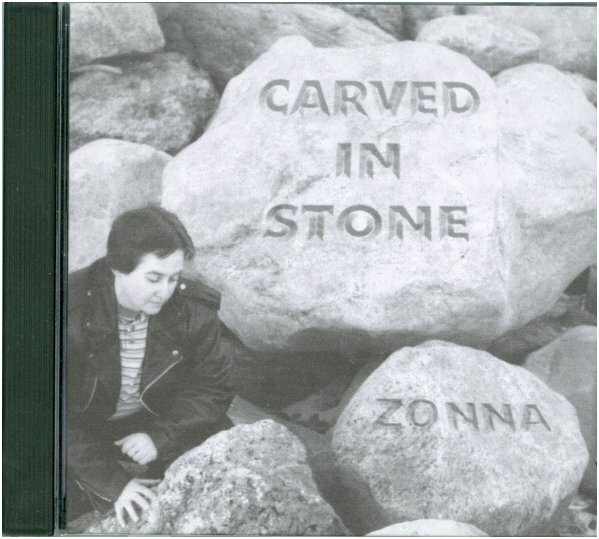 A prolific songwriter, author, and seven-time Billboard Magazine songwriting contest winner, Zonna's published output includes over a half-dozen recordings -- including the acclaimed "Carved In Stone" (1997), "Almost Live" (1999) and "What I Knew" (2000) -- and stories in anthologies from Alyson Publications, Seal Press and Arsenal Pulp Press, among others. Her live performances over a 20-year span included appearances at Folk City, The Bitter End, the Central Park Bandshell and CBGB's in New York City. An accomplished vocalist, musician, producer, and arranger, Zonna ran her own recording studio, Out Of The Crowd Music, from 1993-2003. Her musical contributions to Outmusic artists' recordings include Melinda D's "Dyke Dramas," Andy Freilich's "Dragons," Grant King's "Bodies Of Water," and Corinne Curcio's "Now." She also founded and curated the successful Dream Out Loud songwriter series at several Borders Books on eastern Long Island from 1995-2000. Zonna is survived by her longtime drummer / percussionist and husband of 24 years, Kevin Haining. Planning has begun for a public tribute to Zonna's music. It has been requested that those who wish to do so make a contribution in Zonna's memory "to the left-wing charity of their choice." I knew of Zonna through her music (and seeing her name in the credits of many, many other Outmusic members' albums) for some time before meeting her quite by accident. I had convinced a friend to drive me two hours from NYC to see Outmusic member Dennis Milone at an event he had organized for the Long Island Gay & Lesbian Switchboard. By coincidence, Outmusic members Grant King and Estrogen (Corinne and Carol) were on the bill too. Grant introduced me to Zonna, and it became clear that she was instrumental in having them make the long trek from NYC to use their talents for a worthy cause. I was so thrilled to meet her, but it was tinged with a certain sadness. I knew she had been ill and not performing anymore. One day last year, she came to an Open Mic. She didn't perform, she was simply there to be supportive -- and made a two hour drive to show it. A few months later she came again and performed one song. Breathtaking. Shortly afterwards, she agreed to perform at my apartment and form A Circle of Berdaches with Corinne Curcio. We changed the date a few times. First, so she could help Corinne finish her new album and debut it there. Second, so JD Doyle could get to experience her. It was a magnificent and touching evening. So representative of the goals of Outmusic as I understand them, i.e. LGBT music people working together. Towards the end of her set, she said, "...I miss playing". It was a genuine privilege to meet and experience Zonna. Ed Mannix asked me to write something about Zonna for this page. Because I have experienced so many good friends' deaths, I know enough to realize that since her passing is not even a week old, it's really not possible yet for me to do her memory justice. So I'll tell you the few things that come to mind at the moment. When I first saw Zonna perform, it was at an Outmusic open mic at NYC's Lesbian and Gay Community Center on W. 13th Street. She and her husband Kevin blew me away with their performance. Given the context and their incredible ease of musicianship together, I mistakenly thought that they were a queer brother-and-sister act! (I later learned that I was not alone in this misconception. Like Zonna, I was born and raised on Long Island; as lovely as it is, it is not renowned for tolerating differences. 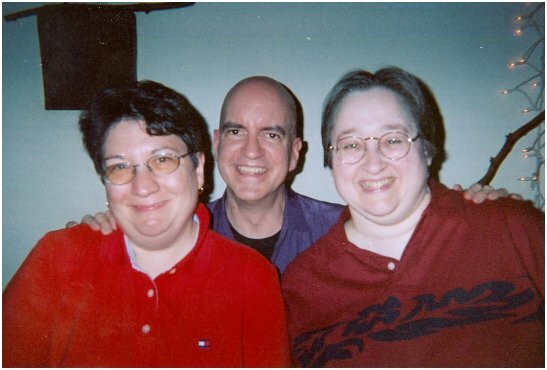 The fact that she and Kevin lived there and were open for many years about their support of LGBT causes brought me to respect them both immensely, especially given that Zonna's open declaration of bisexuality while married to a man caused her no end of grief from many LGBT and straight people who found her bisexuality baffling or worse. But of course once you'd heard Zonna sing or met her in person, all that seemed somehow inconsequential. Partly, I think, because her music was uncensored from her heart, and partly due to the fact that she was simply one of the kindest, gentlest, and most loving beings I've had the good fortune of knowing. In the service of LGBT music, Zonna talked the talk, quietly, AND walked the walk -- no matter the duration or difficulty...and always without any of the selfishness I sometimes wished she could muster to further her own musical career. Of all the things I'll miss about Zonna (and there are many), the thought that continues to bring me to selfish tears is that we'll never harmonize again. Singing with her was one of the purest pleasures I've known. Although we never wrote a song together, we collaborated on numerous projects in different ways. We each featured the other at the out songwriting series we created/curated; we swapped feedback about lyrics, melodies, arrangements; we sang or played on each other's recordings; we attended songcircles together; we played together in concerts. We each took delight in introducing the other to some resource we thought the other would find helpful. Since I've been lucky enough to know the benefits of it, I wish you the similar pleasure of collaborating with someone else here in our Outmusic family. We are such a broad-based collection of talents in so many fields that the possibilities of fruitful collaborations are more like certainties. Finally, for now...Zonna, in my opinion, was a major talent who, in a different musical era, would have had more than a few of her songs in the Top Ten. 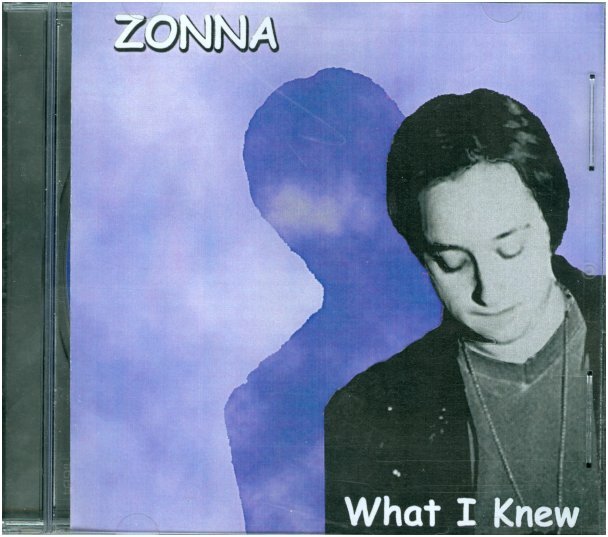 If you would like to hear her music and haven't, Zonna willed me some copies of her last CD, "What I Knew." I'd be happy to send it to you gratis; write to me at knowmoresecrets@att.net. I hope this finds you all well and thriving and making music. Just a couple personal comments about Zonna. I became acquainted with her music three or four years ago, after buying her CD "Carved In Stone." I immediately fell in love with her voice. Oh, that voice! And that her lyrics were Out, and smart and personal was all icing on that cake. I contacted her and arranged to buy all the "back catalogue" that she had available, and now have five cassettes and three CDs, which span her recording career. Through our emails we became friends, but I didn't get to meet her until this past May. I was coming to NYC for the week preceding the Outmusic Awards, and my host Ed Mannix was arranging several house concerts to coincide with my time there. He asked who I would like him to invite and my first request was for Zonna. And it happened. She had not performed live in about four years, but Ed arranged it. She and Corinne Curcio gave a delightful concert, and more importantly, I got to meet the person behind the music. I listened again to that house concert last night, as I had recorded it on my mini-disc recorder, and was reminded of the warmth she brought to her music, with her charming intros to the songs. Her music is still available at several sites; treat yourself if you haven't heard her. She will be missed. Such a loss -- Zonna was a warm, loving, spirited person, generous with her gifts & time, talented and dedicated to her craft, and eager to share herself to help others find their own voice. I still remember the first time I heard her play: it was at an open mike at the Center and I was blown away with the voice, her guitar playing, her soulfulness. I was always impressed by Zonna's generally cheery nature and willing smile. She was a great supporter of OutMusic and its members. She & Kevin helped backstage & in the house at GLAMA and I'll never forget how hard they worked for that first event at the Supper Club because they wanted it to be a great show and they deeply believed in what we were trying to achieve. I'm grateful to Zonna on so many levels and I am so deeply saddened that she is no longer part of our world. Her music, her spirit, her presence will be missed greatly. Those who were lucky to know and hear Zonna were truly touched by her talent, spirit and light. The way she greeted people with a warm smile and a big hug warmed everyone she came in contact with. Thank you Zonna for your music and light. I am so sorry to hear of her passing - I met her at the open mic I hosted and never really got a chance to know her. My deepest sympathies to her family and all those who were so touched by her music. I am so saddened by the news that Zonna has left us. She was one of the first GLBT musicians to be interviewed on my radio show back when I first started, and one of the most delightful beings I've ever been in the presence of. She was full of light and always had a great smile and big hug to share. We kept in touch after the initial interview and became friends via email and telephone. She was an amazing musician who never got the exposure and honor she deserved, in my humble opinion. I booked her for the day stage one year at the now-defunct women's music festival, NEWMR (North East Women's Musical Retreat). She was great! That was the first time I met her in person after all the time we'd spent with email and phone. I'll never forget the hug we shared that day. I hope that if you haven't already been familiar with Zonna's music, that you will seek it out now and appreciate the genius that she was. And the wonderful person that she was. I wish I could be a part of whatever memorial event happens, but being down here in Florida, I know that can't be. Even though we hadn't been in touch for awhile, I do miss her and the knowledge that there will be no more of her wonderful music. 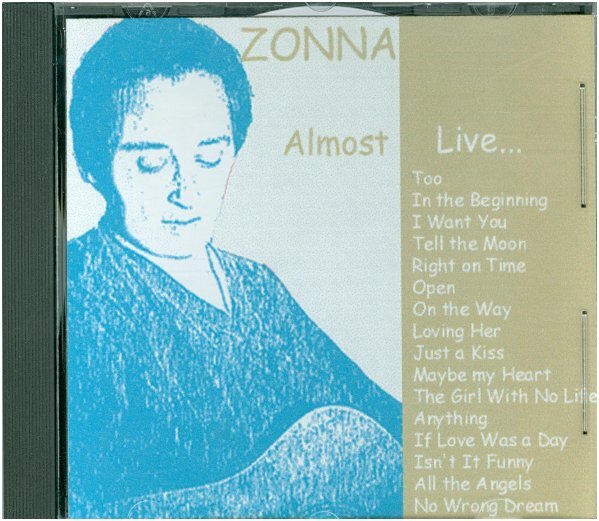 Shine on us, Zonna, we're still doing our best to get the music out there as out GLBT people! You had a big part in that and you are appreciated, loved and dearly missed. I could mention Zonna's extraordinarily beautiful voice and songs. Or her selflessness when it came to her friends and fellow musicians. To tell you all the ways she touched my life and how much she meant to me - words could never do her justice. I am going to miss her gentle, playful, brilliant, and loving spirit. Outmusic has lost a bright light. What sad news. I only met Zonna twice but I liked talking with her both times. She was smart and talented and had a good sense of humor. After knowing her for years as musician and curator, I got to know Zonna as a friend during a very difficult time in my life. She was a compassionate and caring person who knew instinctively how to be there for me. Over the years, our friendship deepened and my life was enriched by it. When Zonna became ill, she hardly ever complained - though I was angry on her behalf and felt that the powers that be had some answering to do! She maintained her spirits and continued her creative pursuits, though she felt discouraged when her voice could no longer do the feats it had once performed. Of course, her voice always sounded terrific to me, and her energy and care for others were an inspiration. I will miss her. I am so grateful to have this information about Zonna. 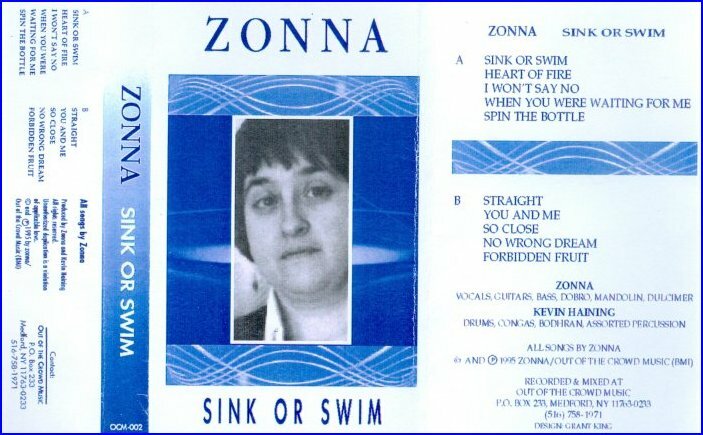 I have been working on an album which will have Zonna's name in the credits because I recorded some bass guitar and vocals at her studio some years ago. I have been seeing her name in my notes for so long and I am so sorry that she won't see the fruits of this labour. My condolences go to Kevin and to all in the musician community who Zonna touched through her generosity and sense of humor and general "left of center" way of life. This is an awful loss. I'm sorry this is late. I wasn't going to write anything for this series because I didn't really, really "know" Zonna -- I mean, we knew each other and, I think, respected one another, but we weren't "friends" per se -- she didn't call me up to check on me or anything and I didn't even know she was sick. I guess that's how it goes sometimes. where not even gay bookstores stock indie music anymore. I felt embraced, not just by Zonna, but by the community of queer musicians. image, your press release, your awards and your busy-busy calendar. More than sponsors, we needed a safe place to sing for people who thought we were saying something important just by being out. Times have changed, but I've made a medium-successful career (hey, I pay my rent! ), initially encouraged by that early community of Outmusicians and that brief time in the studio with Zonna, eight years ago. I remember Zonna complaining about slow tape sales once. We've all been there. But I remember it even more so now because that kind of honesty is so hard to find. It seems like everyone only tells you that they're "doing great," or is the "worldwide most bestest thing since sliced bread ever." 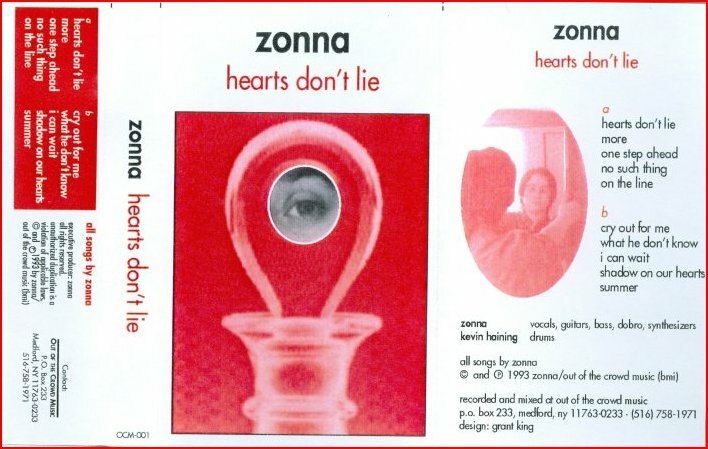 But Zonna was really honest. She said, "I have a recording out. It's tough to sell." She didn't pump it up to be something it wasn't. It was just the next step in her musical journey and she hoped some folks would join her for the ride. She admitted not being a "great marketer" but didn't seem to obsess about it. With that, she inspires me to be honest with myself and my friends. So, thank you, Zonna, for recording my voice and being gentle with me. Thank you for helping me create something of value in spite of my insecurities. Thank you for capturing a moment of my life when I was terrified to move forward but determined not to show it. Clearly, from the words of so many who knew her well, Zonna understood this. She lived quietly, did her work with dignity and purpose. Loved by her husband, friends and admired by her colleagues, she gave honesty and gave of herself honestly. May we all know such grace. Zonna was my oldest (longest?) friend; we met in the 5th grade. Though we sang together in the chorus all throughout elementary and middle school, our friendship really blossomed in high school when we recognized that we each were starting to experiment with songwriting. It was during these years that we built the foundation of a musical friendship that spanned all of the years since. We began singing together regularly in the 10th grade, during which time we joined with a flute player to form a trio called Daybreak. We wrote and performed original songs as well as cover tunes. Our first gig was at an old age home. Though the crowd didn't give us the standing ovation we had hoped for, we knew they appreciated us being there. Those of you who love Zonna's work recognize her as a gifted songwriter. However, you may not know how precocious a songwriter she was. From those early days in high school, Zonna's writing showed a clear sense of style, form and each song was crafted around a memorable hook. While I struggled over each tune I wrote, Zonna was a virtual "hit-machine" turning out song after song after beautiful song. 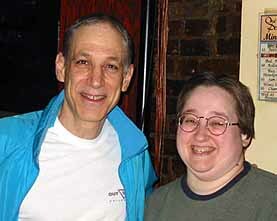 To this day, she remains the most prolific songwriters I have ever known. Throughout the years, our paths converged and diverged, as is often the case with lifelong friendships. But, no matter how long a time since our last encounter, we would always sing together as effortlessly as we did when we were girls. We knew each others voices as well as our own and would instinctively weave our sounds together; each being mindful to cover for the others weak spots and make room for the others "jewel notes". No matter how much we had changed on the outside, when Zonna and I sang together, we were both 15 again. Zonna was not just my longtime friend, she was my musical "home". So many of her lyrics have been circling in my mind this past week, but the excerpt from the song below seems most prophetic now. It's from a song called "Parting of the Ways", written in 1975 or 1976. When the way is clear"
Though Zonna is gone, her songs and her words will be with us forever. What a special gift she left us all.